WELCOME SURVIVORS & THRIVERS (STAGE IV)! Whether you're recently diagnosed, in treatment, in remission, or metastatic, if you're a co-survivor or supporting family or friends, join others who have been through it too - honor and celebrate your journey. You are the heart of Race for the Cure. We are rolling out the pink carpet especially for you! We are happy to announce that the pre-Race Survivor/Thriver Celebration of Hope will take place in proximity to the 2018 Starting Line! Hope Village itself will be will remain in the traditional location near the bandshell! Stay tuned for all the exciting details. Survivor/Thriver Parade to the Bandshell & Bethesda Fountain. Group Photo and Dance Party! This is a celebration of survivors you'll never forget! Your presence at the Race is vital, providing hope and inspiration. Join us on Race Day, and together, we WILL create more survivors. We recommend booking convenient and affordable parking in advance through the SpotHero parking reservation app. 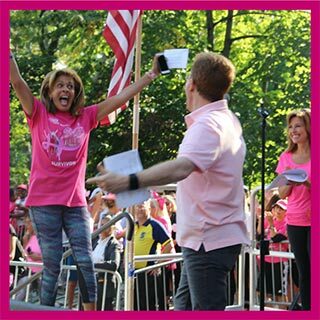 To reserve your parking spot, visit the Susan G. Komen Race for the Cure NYC SpotHero Parking Page and book a spot with rates up to 50% off drive-up AND a portion of your purchase donated back to Komen NYC.